Like many Americans, Tommy Greenwald has a complicated relationship with football. He was thrilled when his son Jack played. Jack had a great football career, with Westport PAL and Staples High School. His father appreciates what he learned from intense practices, tough games and his relationship with his coaches. But, Greenwald says, “the football culture — with its pressure to be tough and strong, to play hurt, to not be perceived as soft” — has its downsides. 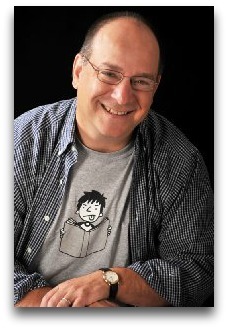 That’s the heart of “Game Changer.” Published this month, it’s the local author’s 10th book — and a departure from his previous “Charlie Joe Jackson” (named for his 3 sons) and “Crimebiters” young readers’ series. 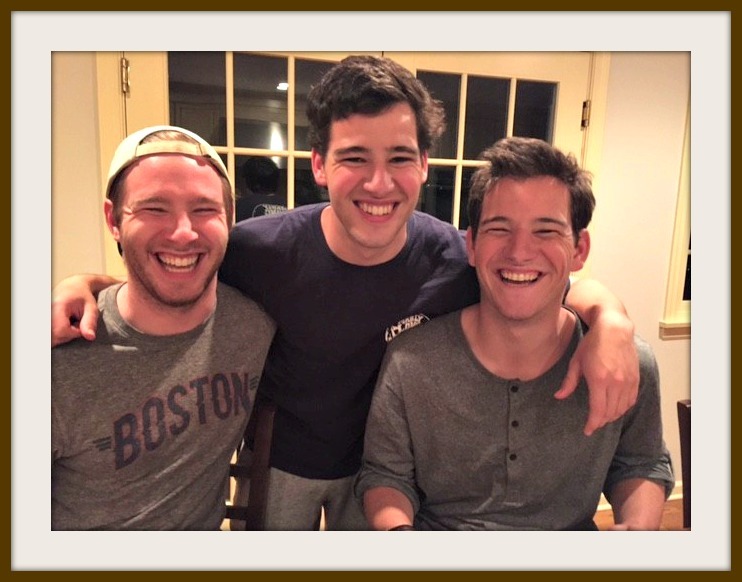 Jack Greenwald (center), with his brothers Charlie and Joe. There’s not a laugh to be had in this one. There are no wise guys, no dog with special powers. “Game Changer” is deadly serious — almost literally. 13-year-old Teddy lies in a coma after a football injury during preseason camp. His family and teammates flock to his bedside to support his recovery — and at the same time trade rumors and theories on social media. Was this a tragic but fairly common result of a violent sport? Or did something more sinister — bullying and hazing perhaps — happen on the field that day? 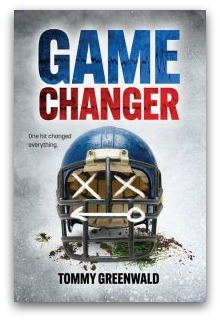 “Game Changer” is different type of book. It mixes together dialogue, text messages, newspaper stories — and Teddy’s own inner thoughts. It’s different too in that it’s a no-holds-barred look at the terrifying risks of a major American sport — and the entire culture supporting it. Greenwald is emphatic that this is a work of fiction. He added an author’s note to that effect at the end. He says he never saw or heard anything like what happened in “Game Changer” during Jack’s Westport career. “Game Changer” is not, he insists, a condemnation of football. “My respect for coaches, the life lessons they taught, the lifelong friendships Jack made, is amazing,” Greenwald says. But his book is “a wake-up call for everyone — including me,” he adds. “People — including me — have to pay more attention to the culture and the injuries” of football. Greenwald never had to confront the even more dangerous effects of football at the higher level. Though Jack was “semi-recruited” for college, he ended up at Elon and did not play. He graduated from there last June, and now works at a Boston cyber-security firm. Greenwald — who won a state championship as a Staples High School soccer captain in 1978, and whose son Joe was a Wrecker soccer captain in 2012 — remains a “huge” NFL fan. “I read, like everyone else, about the dangers,” he says. “And like everyone else I camp out every Sunday looking for the best games. This entry was posted in Children, Entertainment, Local business, People, Sports, Staples HS, Teenagers and tagged "Game Changer" book, High school football, Staples High School football, Tommy Greenwald, Westport PAL, youth football. Bookmark the permalink. I am thankful that this is not the football culture that my son has grown up in here in Westport. He is an 8th grader, and I have never worried that he would be told to tough it out if he told the coach he was hurt. I’ve also never known him to hide an injury for fear of persecution. On the contrary, the coaches have always been abundantly cautious because they know the stakes are high for their players and for the future of the sport. Tommy: between the demands of your high-level job and all of the writing you do, how do you find the time to watch NFL games on Sunday? I think your next book should be a guide to time management. The coach came out to see how I was doing and asked if I wanted to stay in the game. I immediately replied “no” and then blood started pouring out of my nose as I finally sat up; I felt as if my nose were broken. One of my teammates was stunned by my response and asked if I had heard the question clearly, I said I had and I knew we were up 2-0 so, all things considered, I was content to head for the sidelines. There is no way I would have been given the opportunity to stay in the game if a similar situation happened today—and that’s a very positive change. Different times. I played tackle football/ no equipment. The toughest Fairfield vs Westport guys. Took some wicked hits. Softball, I ran full speed into fences to make catches multiple times. That’s just what we did.